Feeding birds involves making a pact with the Devil, but it got so cold and rainy I felt so sorry for the Spotted Towhees scratching around back there that I went and bought some bird food. Between the creek and the free food, we’re chumming in some nice birds. 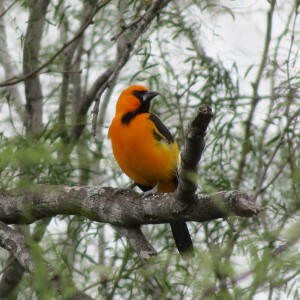 One standout bird that showed up today (Delia predicted it. She said “Watch for Redpolls tomorrow they might show up in the backyard) was a couple or more Redpolls that came mainly to bathe. This is a northern bird that shows up in our area irregularly, it can be fairly common or nonexistent some winters. 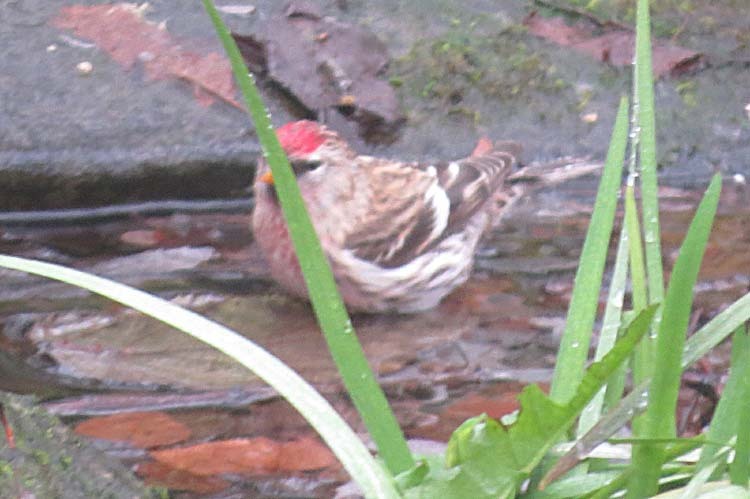 Here’s one of the Redpolls. It tried to hide behing a blade of grass, but what doesn’t kill a photograph only makes it better, at least that’s the way I look at it. This is our 50th species of the year in the yard, or from the yard. That’s an average or even sub-average year. I was in North Dakota for part of the spring. This White-throated Sparrow has been around all winter, off and on. Like all of these guys, he’s one handsome Dan, this photo doesn’t really fully show it. We also had Towhees, White-crowned, Golden-crowned, Fox and Song Sparrows at the creek today and Pine Siskin , Black-capped Chickadee and Anna’s Hummingbird. Didn’t see the usual 20 Robins today. We were at Nisqually on Christmas Day. Here is a shot, “Assorted Christmas Ducks.” There’s Eurasian Wigeon (big with a red head), American Wigeon (white on top of the head) and Green-winged Teal (smaller). Here’s a shot I like of some Northern Pintails milling around. Somebody could maybe get a really good shot of these, and they were mingling with Shovelers, that might be make a great picture. The Great Blue Herons down there just keep getting tamer. I didn’t realize I was going to blog I might have been able to get a better shot but the Great Horned Owls are going to put on an even better show this year than last. You don’t need to know where they are, just watch boardwalk for tripods.